The study from the University of Lausanne, Switzerland, suggests Florida carpenter ants can collectively influence their communities by shifting the cocktail of proteins, hormones and other small molecules that they pass mouth-to-mouth to one another and their young through a process called trophallaxis. "Food is passed to every adult and developing ant by trophallaxis. This creates a network of interactions linking every member of the colony," says senior author Laurent Keller, Professor in the Department of Ecology and Evolution. "A lot of researchers consider trophallaxis only as a means of food-sharing," adds Professor Richard Benton of the Center for Integrative Genomics, also a senior author of the study. "But trophallaxis occurs in other contexts, such as when an ant is reunited with a nest-mate after isolation. 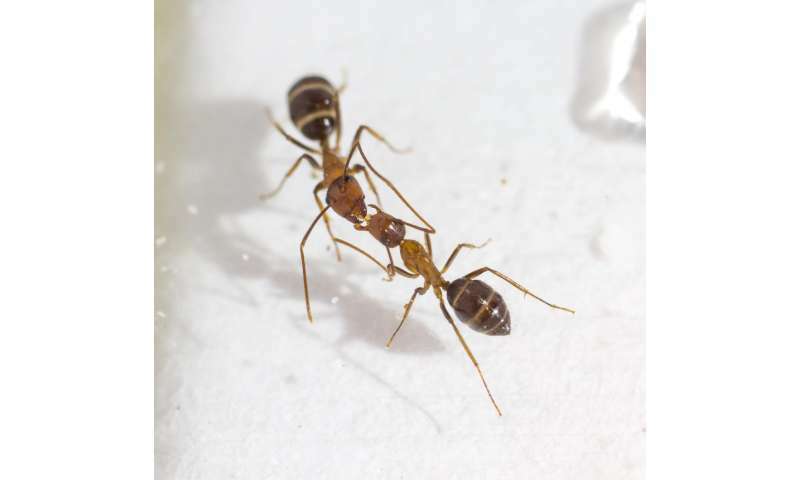 We therefore wanted to see if the fluid exchanged by trophallaxis contains molecules that allow ants to pass other chemical messages to each other, and not just food." To answer this question, the team, led by first author and postdoctoral researcher Dr Adria LeBoeuf, analysed fluid from pairs of ants engaged in trophallaxis. Surprisingly, they identified a large number of proteins that appear to be involved in regulating the growth of ants, along with high levels of juvenile hormone, an important regulator of insect development, reproduction, and behaviour. To see what effect this hormone has on the growth of larvae fed by trophallaxis, the scientists added it to the food of larvae-rearing ants and discovered that the hormone made it twice as likely that the larvae would survive to reach adulthood. 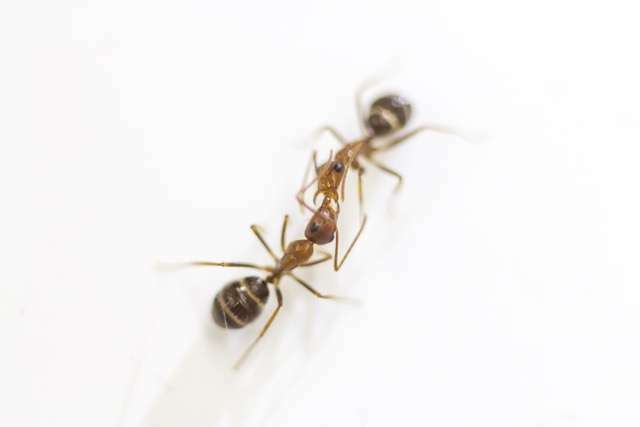 "This indicates that juvenile hormone and other molecules transferred mouth-to-mouth over this social network could be used by the ants to collectively decide how their colony develops," says LeBoeuf. "So, when the ants feed their larvae, they aren't just feeding them food, they are casting quantitative ballots for their colony, administering different amounts of growth-promoting components to influence the next generation. "The effects of juvenile hormone that we see are consistent with previous studies in other ants and in bees where larvae treated with an analogue of this hormone tend to develop into larger workers and even queens." Along with growth proteins and juvenile hormone, the team also identified small molecules and chemical signals in the carpenter ants' trophallactic liquid that help them recognize their nest-mates. They demonstrated for the first time the presence of chemical cues in the fluid that are known to be important in providing ants with a colony-specific odour that allows them to distinguish family from non-family members. "Overall, we show that liquid transmitted among ants contains much more than food and digestive enzymes," adds LeBoeuf. "Our findings suggest that trophallaxis underlies a private communication channel that ants use to direct the development of their young, similar to milk in mammals." "More generally, this opens the possibility that the oral exchange of fluids, such as saliva, in other animals might also serve previously unsuspected roles." Similar proteins which induce longing are exchanged in human kissing. The proteins are receptor proteins, usually dissolved in tears. Kissing picks up 735 chemicals which make up skin surface lipids. Sexually dimorphic, changing with age, one component, sebaleic acid, is found nowhere else in nature and marks us as human beings. Kissing, pheromone exchange, establishes families. You are aware that in over half of the world's cultures kissing is not performed as a romantic act (or not performed at all)? ...and yet these cultures are able to produce families just fine.